I cleared a space in my freezer. Five pans of enchiladas. Last night was my first meet up for the Freezer Meals group that I joined. One of the moms in my La Leche League group had the idea to start up a new group and there are five moms that are participating in this first meeting. Freezer cooking is a whole new world for me. I heard about stocking your freezer when you're expecting a baby, but I had no idea how to do it. Any busy family would find it helpful to have meals prepped in the freezer to whip out for a week night. I work from home two days a week, which helps because when I work in the office I don't have time to cook in the evening. I usually cook on Sundays for the week anyway. So freezer cooking appealed to me because you cook in bulk. Our Ground rules: Our group decided to exchange frozen meals to serve 5 people in family. The meals should be healthy and if you include meat, it should be locally sourced without antibiotics. The idea is to provide a meal with a side dish or dessert and any add-on items for the pantry. 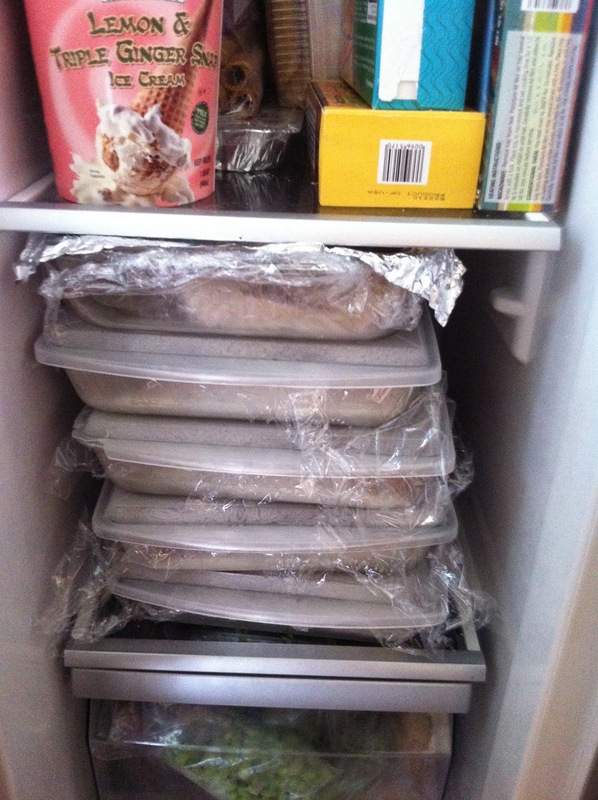 We wrap up the meals in plastic wrap or foil and then freeze for the monthly exchange. The week before, the women add a blog post with their upcoming menu as the RSVP. I decided to make 5 meals to giveaway and 1 meal for ourselves, which I cooked on Sunday night. 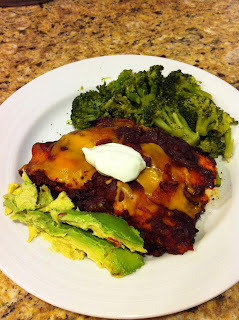 My first freezer meal is Sweet Potato-Black Bean Enchiladas with homemade sauce and glazed carrots. I was disappointed with the corn tortillas because many broke open after I rolled them in the pans. But once you put the sauce on top, you won't notice. I make this filling all the time for my own family, but I wanted to make a homemade sauce similar to the one that my family makes. Enchiladas wrapped and ready to go with the sauce and side dishes. I packed shredded cheese separately for the exchange (left unfrozen). Freezing the meals was interesting! I'm lucky to have another refrigerator in our garage so I could manage the bulk cooking. I cooked the enchilada sauce last Sunday while Ava was playing with Grandma and Grandpa. I stored a quadruple batch of sauce in the fridge all week. For the dried black beans, I had to cook it in the slow cooker in two batches because there were so many beans. I cooked 1 batch on Sunday overnight and the next batch while the slow cooker was still out on Monday while we were at work. Again, I'm glad we had lots of refrigerator space to store all those cooked beans! Then this weekend, I cooked the rest of the filling - sweet potatoes and onions with peppers. Saturday night, I assembled the enchiladas and placed them in the pans to freeze. I portioned the sauce in freezer bags separately because I read from another website that tortillas would be soggy if they were frozen with the sauce. It was helpful to space out the cooking load to several days. I quadrupled this recipe to make 6 pans of enchiladas and I still have a couple more servings left with all the sauce. So I froze an extra batch to use later. The sauce is very thick compared to store bought. I couldn't find enough dried chiles for my extra large batch so I used 3 large poblano peppers chopped and cooked them with the onions and garlic. Wearing gloves, clean the dried chiles by removing the stems and seeds. Don't touch your face. Set aside in a bowl. Saute onion in olive oil. Add cumin and cook, stirring constantly, until well amalgamated into the oil. Whisk in garlic, tomato paste and vinegar. Add stock and chiles, bring to a boil. Reduce to a simmer. Simmer covered for about 45 minutes. Pass the sauce through a food mill or puree in the food processor. Season with salt to taste. 1 cup dried black beans, soaked over night. Preparation: these can be done ahead of time and stored separately in the refrigerator. Cook soaked black beans in the slow cooker overnight or all day (on LOW for 8-hours). Water should be about 2-inches above the beans. See my blog post on detailed instructions. In a large preheated skillet, add cooking spray or olive oil. Cook onions, peppers, and sweet potatoes on medium-low until the sweet potatoes are tender (about 25 minutes). Add seasoning to the vegetables when you start to saute. To assemble: Mix black beans with sweet potato-onion mixture and add sea salt. Warm tortillas. Fill corn tortillas with about 3 tablespoons of bean-sweet potato mixture. **If cooking immediately: coat 9x13" casserole dish with cooking spray. Add a few spoonfuls of enchilada sauce to the bottom of the dish. Begin adding enchiladas to the pan. You can fit 8 across vertically and 4 horizontally at the top. **If freezing, line the casserole dish with plastic wrap. Build enchiladas in the dish in the same format. Freeze sauce in a separate container or bag. When cooking, add defrosted sauce on the bottom of the pan before baking. Add remaining sauce by spreading evenly on the enchiladas. Sprinkle with shredded cheese. Bake in a 350 degree preheated oven for 45 minutes. If you have extra filling left, you can squeeze in more enchiladas or save it for a burrito for a quick meal later in the week. Serve the enchiladas with vegetables or a green salad. Garnish with hot sauce, avocado, fresh cilantro, and sour cream. Let me know what you think! Got Cloth Diaper Stink? Time to Strip!